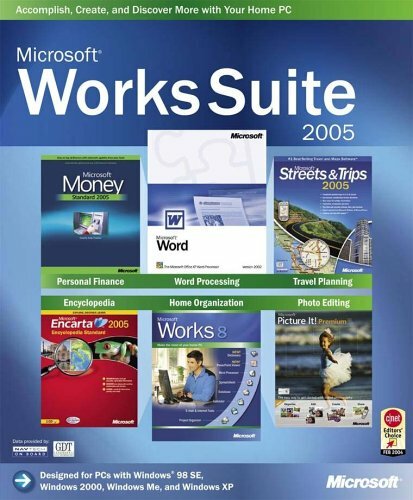 To begin with I have used a Microsoft Works but it was Works 95. I was thrilled to be able to test this out. It was very easy to install but did take a little bit of time. Well the first thing I wanted to do was try everything. But, of course that is impossible to do. So, I opened up the Picture It. Well, I was so amazed at the ease of the usage of this program. I was able to click on things and had all kinds of options for me to continue with. I loved it. And then I thought well why not and I decided to make a card for my husband. Well, he is a good guy and I did it just because. Well, I have to tell you that it came out great and I was amazed. I even layered some pictures on it give it a collage effect and it worked great. I know that he will like it. Well, then I am one that loves to see what I have so I spent the next half hour going through the Picture It program and all of the pics that there are in it. Of course I never did see all of them but it is something else. I loved it. A big thumbs up on that alone. Then my daughter had to borrow the computer to type a report for school. I went to make our dinner. So, she ended up using the Word program and she loved it. Well, you see she does a problem with some of her pronunciation and Word was helping her with that. She even was able to insert a picture into her report and I think that she will be getting a good grade on that. I asked her what she thought of it and well she also gave that a thumb up. So, you are batting a thousand. Ok, so then I decided to check out the Streets and Trips program and well, what can I say? It was fantastic and worked great. I had a place that I was planning on going to but was not really sure the best way to get there so I put it in and it gave me the quickest way. And the next day I used the directions and well it worked out better then ever. Thanks once again. Ok, now as for the money program I will leave that for my husband because he handles all of the finances and I am not really sure if he will even want to use that part but he might play with it. Now about the Encarta. When my younger son came in and he was telling about some things that he had to do for school, a light bulb went off in my head and I figured that he could use that Encarta and do his research with that. Well, he liked that idea instead of having to go to the Library so he used it and he was able to find everything that he needed for his report and he even got it done early. Well I love to play games after all I am an EverQuest Addict! So, it is not that easy for me to try out another game because first I had to pry my hands off of the EverQuest game. But, alas I decided to be man enough to try this game out. 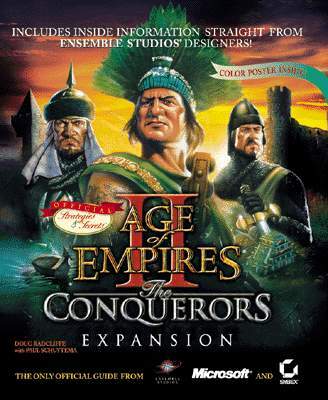 I did have the Age of Empires already loaded onto my computer. So then I loaded in the expansion pack. And decided that I would give it my all and try my best to see if I would enjoy it as much as I do EverQuest. Ok, so I settled down in my comfortable chair and got it turned on and started it up. I was really impressed with the graphics of this game and loved how the sounds were coming out of my speakers from it. It seem like it was not that hard to figure out this game. That I liked the idea of how the civilizations were and the ease of it. I was amazed at this game it seems like it might be a lot of fun for me to play. I am not one for a lot of words either. I guess I cannot really compare it to the first one because I was not the one that played that but I can compare the overall to some of the other games like EverQuest that I do play. And all in all I do like this game. As I said the graphics are great and the playability (if that is a word) and the sound effects I do like also. So, ok, I will say that this game is another one worth me to keep playing and have some more enjoyment out of it. So, yes I agree it is a good game. And ok, when you get another expansion pack, I will be checking that out also. Thanks....Microsoft! Perfect your photos quickly and easily with Digital Image 9 Pro photo editing tools. With this photo management software, you can make your photos look exactly the way you want! This looked like a really interesting program. I loaded it onto my computer and it went on really easy. It did take a little bit of time to put it in. I had to wait until later to use it. But, when I went to use it I seen all of the things that it says that it can do when it first starts up. I needed to make myself a calendar because that is how I keep track of things. So, I clicked on that and I was amazed at the selections that there was already made up. I did not have a hard time finding one that I wanted and like and I printed that up. It of course had one of those inserts where it had where I could insert a picture in it and I liked that because I put a picture of my kids in it. So, they can be there for me to see. That I think is a nice idea. Then I thought well I wonder how it will work with my scanner so I went to scan a picture with it and it worked better then my other software that I had before. Then I did some of the changes on the picture that I scanned and it come out great. I was totally amazed at all of this and even though it was not to easy to use I was able to do it so it cannot be that hard. So, I went online and found a really cool picture and saved it to my computer and I went to change it and I made it a lot of different ways with your software and it was really nice each time. I do want to play with this software more because I know that I want to play with this a lot more and then I am not sure if I will ever get to use this to the full capacity that I can but I do love it and think it is a great program. And I will truly recommend it to everyone and anyone that I can get to. Keep up the good work.